1617-1618 BLOIS William, near his home 'The Christopher'. The width of this map represents 0.7ml / 1.12km. William Blois (1562-1621/2) was an Ipswich merchant, who, along with partners John Madock and Thomas Foynes, both of Plymouth, and John Brooke of London, traded goods the like of herrings from Lowestoft, lead from London & Newcastle, Suffolk broad cloth, cloth from Norwich, stockings and hose of many kinds, wax, soap, etc, as well as dried fish from Newfoundland. They were carried to ports in Spain, Portugal, France & Italy where they were sold and the proceeds either sent home or used to purchase other goods locally for return to England, e.g. silk from Granada, saffron and cochineal ...... and sugar from Lisbon and London (1). 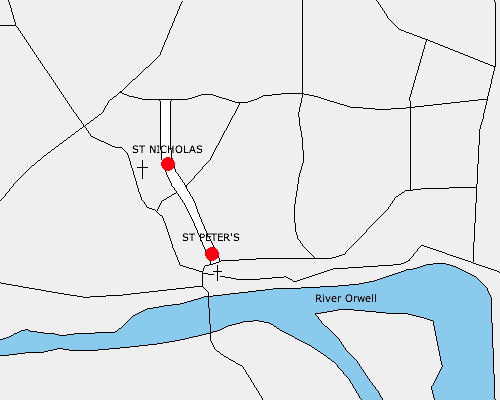 Late in 1617 the partners began a sugarhouse close to William Blois's dwelling, The Christopher, in St Nicholas Parish, Ipswich (2). By February 1618 the partners were listed as William Blois, John Ackton, Robert Benham and John Baker, and the sugarhouse valued at �66 with a balance of �0. In October 1619 these same four agreed to each place further funds into the sugarhouse account, thus increasing its value to �89. Much of the trade appears to have involved bills of exchange, with Blois specifically stating 'money' when it has changed hands. John Rennouls ... probably bookkeeper from the start. Peter Isam ... manager from the start (� per quarter), master workman. Lennard ... boiler from the start (4s-7s per week). Robert Debedge ... ?boiler began a couple of months from start (� per year). Henry Bud (Harry) ... probably labourer, little mention of him. Peter Wyssop ... manager, took over from Peter Isam, probably early 1619 (�.10s.0d per quarter). Died November 1619 and the company paid for his funeral and appears to have found all sorts of ways of helping family. Amner ... labourer (1s per day). William Foply ... just one mention ) did one of these take over Peter Wyssop's duties, I wonder ? cousin Hunting ... probably the bookkeeper, appears to have taken over from John Rennouls in January 1619/20. Peter Wilbart of Stoke [? Stoke, Ipswich or Stock(e), Essex ?] from whom the sugarhouse bought its moulds (forms) and jars. Robert Wilson a local cooper for "small hoops and great hoops set upon the great forms" (bands around the moulds to stop them breaking). "Hubbard the scoopmaker for eight scoops for the skimmer". ... And these accounts give us a full appreciation of just how many eggs were used in the refining process at that time. A company accounts book (3), one of two Great Books, has survived and is held in the Ipswich Record Office. Chronologically, the accounts are a jumble. Certain blocks of pages of the book had been allocated to the sugarhouse accounts with more general trading accounts gradually filling the pages around them, though these do include various sugar-related entries. Space unused by William Blois was, some 30-40 years later, used by a Henry Blois for his personal accounts. Continuing below are transcriptions of the sugarhouse accounts. I've listed the sugar-related extracts from the general pages in a single column, and fully transcribed the pages dedicated to the sugarhouse in double columns as in the ledger. These are my transcriptions, using present day spelling for the most part, and I've highlighted in bold the more important entries that throw light on the industry at this very early time. Mr Rennouls to keep the account for triffles disbursed by him 1s. For [ ] bought of Mr Algat in July 1618 8s. For packthread the 22 June 5s. 2 more the 12 September 6s. the paying the Flemming the freight the sugars �.0.0. for the sugars due to Mr Jenny �.0.0. in part of his wages the 12th September 1618 20s. This is part done by estimate until it may be perfect. monies from Rome as in the other side. by Mr John King being for the lead sent to Seewell? William Blois was buried 15 January 1621/2 at Grundisburgh, but as yet I don't know when the sugarhouse closed. Further research ... Robert Smith, son of Henry Smith of Ipswich, was baptised at St Mary at the Quay 28 Apr 1620. Siblings Henry and Thomasine were also baptised there in 1623 and 1625 respectively. There are burials for Henry Smith at Ipswich St Clement in both 1625 and 1626. This would imply that the sugarhouse was still in operation in 1625, or even 1626.